Sussex Schools Under 15 v Inner London Schools at Three Bridges (Gareth Southgate) England Manager. Standing second from left. Photographer Bryan Allen sent in this photograph of Sussex Schools under-15 football team before their match against Inner London Schools, taken in 1985. Pictured second left on the back row is England manager Gareth Southgate. Bryan’s son Dean Allen is second from the right in the front row and the picture also features many familiar names in Sussex football who continued to play and manage in the county and beyond. Eastbourne United manager Tobi Hutchinson is pictured in the back row, fourth from the left. Dean Allen is Laughton Allen’s cousin and nephew of Gary Allen and played for Ringmer and Lewes FC. Tim Read, the goalkeeper, played for Worthing and then Woking and was in goal when Tim Buzaglo scored a hat-trick to knock West Brom out the FA Cup. Darren Hinton was the son of Marvin who played for Chelsea in the 70s and enjoyed FA Cup and Fairs Cup wins alongside the likes of Peter Osgood and Norman Hunter. 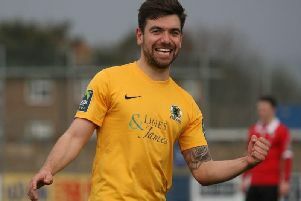 Paul Tuppeny represented Hastings and Rye United while Stuart Noakes is a coach educator in Sussex for Essential Sports. Ian Nye played for Shinewater and Eastbourne Town while Darren Hinton, Ian Nye and Hutchinson were all Eastbourne United players at the time. As was John Robinson, who was missing from photo. Robinson went on to play for Brighton and Charlton and more than 50 times for Wales. The full line-up: Tim Read, Gareth Southgate, E Sullivan, R Phillips, S Noakes, I Workman, P Tuppeney, D Hinton, T Hutchinson, D Allen, I Nye, M Smith.